Bangalore University took birth in the year 1964 with only 32 colleges and a student population of 16,000. Today, it is one of the largest Universities in the country and in Asia with about 700 affiliated colleges and a student population of about 4.00 Lakhs. It has about 50 post-graduate departments which offer around 75 PG Programmes. The University has 6 specialized Centres and 3 integrated Programmes. It has also 3 University colleges – UVCE, University Law College & University College of Physical Education. It has completed 50th year of its fruitful existence. I can say with legitimate pride that the University has achieved far more than just the modest target set at the time of its inception by producing a trained human resource to serve the country in all walks of life and by contributing to the knowledge base. 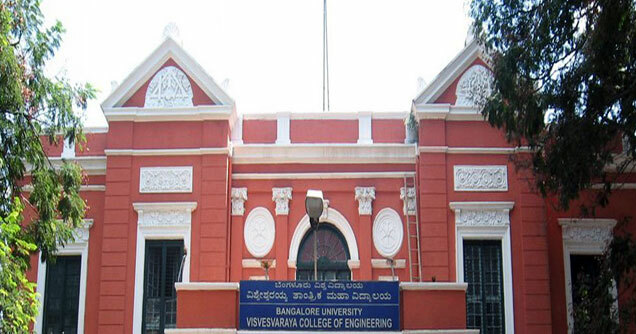 Bangalore University has two campuses, Jnana Bharathi, the main campus ; and the Central College campus. We also have a PG Centre at Kolar and we are to establishing, a PG Centre at Ramanagaram. Bangalore University has introduced Choice Based Credit System in all its Under Graduate and Post Graduate programmes, with multiple exit options with multiple degrees in the faculties of Arts, Science and Commerce effective from the academic year 2014-15. For multifaceted development of students, curriculum emphasizes on wide variety of courses to enhance their knowledge in several core courses. Thus the present Post Graduate programmes in subjects have been restructured to implement the Choice Based Credit System Scheme and to introduce an exit option with Honours Degree in the subjects at the end of Istyear of 2nd year PG Programmes, provided the candidate has studied that subject in all the three years of that Under Graduate Programme. The successful completion of II year of the Post Graduate Programme would lead to Masters Degree in the subjects. The restructured Choice Based Credit System scheme makes the product of University at par with the Global practices in terms of academic standards and evaluation strategies, retaining structures of the present Under Graduate & Post Graduate Programmes. Our infrastructure is huge with equipped laboratories, highly qualified and motivated faculty, who work with commitment and dedication for the cause of education and research. Our officers and the non-teaching staff work with dedication and commitment. The research output of our post-graduate departments is very good in terms of Ph.D. degrees awarded and research publications in good impact factor journals in India and abroad with a large number of citations. In the recent 49th convocation 204 candidates have received the Ph. D. degrees. Post-graduate departments have organized a large number of national and international Seminars and Conferences. The University has been chosen for the Promotion of University Research and Scientific Excellence (PURSE) project of DST, the Govt. of India at a cost of 9.0 Crores for 3 years. It has been offered to the university based on our research output in terms of institutional h-index. A number of sophisticated instruments have been added. Several of our PG departments have also been selected for UGC-Special Assistance and DST-FIST Programmes apart from a large number of sponsored individual faculty research projects from the national funding agencies. In addition to these several thrust areas of our faculty in the PG departments are selected for assistance under CPEPA, Centre with Potential for Excellence in particular areas, with a grant of ` 4.75 Crores. We also have several innovative Programmes. The University Grants Commission has also sanctioned Rs. 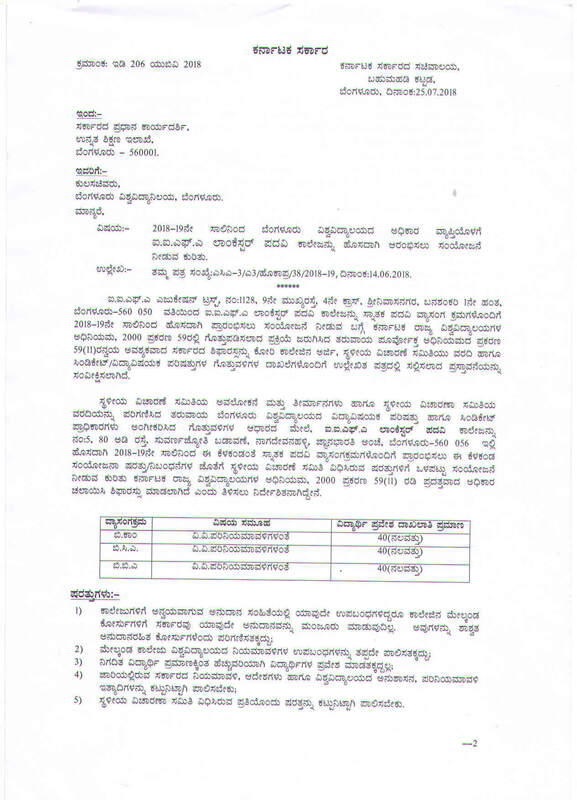 21.25 Crores to the University as the 12th Plan grant. The North Eastern Council of Govt. of India has sanctioned a grant of Rs. 14.65 Crores to the University for building a Girls Hostel Complex on our Jnana Bharathi Campus to accommodate about 500 students from the North Eastern region studying in Bangalore. The UVCE, the University Engineering College of the university has received the second phase of TEQIP grant of Rs. 12.5 Crores for improving the academic and research infrastructure. Academic tie-ups have been established with several reputed research Institutions/organizations within India and abroad. Our faculty have received number of recognitions and awards such as UGC Research Awards for 6 Teachers, Indo-US (Obama) Fellowship two teachers, Young Scientist Awards, 4 Patents etc. Some of our faculties are the fellows of National Academies. 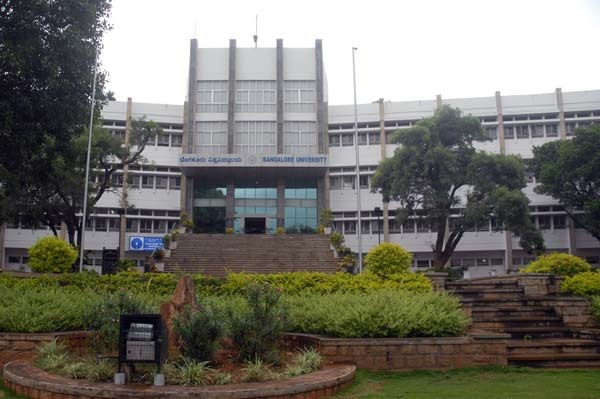 Bangalore University Library operates from two campuses Jnana Bharathi and Central College Campuses. Total collection of University library exceeds 3,36,000 books and 175 current periodicals, which include 8,554 Theses and Dissertations. BU Library is getting 7,500 online journals under UGC-INFONET Programme; has extended R3 access of teachers and Ph.D. students. The University has established a Centralized Placement Cell at the Canara Bank School of Management Studies, Central College. The Centre will cater to the pre placement training and placement needs of Post Graduate students of Jnana Bharathi and Central College Campus. The University has Braille Resource Centre for visually challenged students with disability such as blindness and low vision studying in UG courses in autonomous and affiliated colleges. Presently 163 students arebeing provided with study material (Txt books and reference books) in the Braille format; CDs of the text books; a monthly scholarship of Rs. 500/- for 10 months. The activities pursued include independent living skills, Looking Good, Staying connected, Outreach activities, Fun and Fitness, Kitchen Confidence and Counseling for motivation and job opportunities. 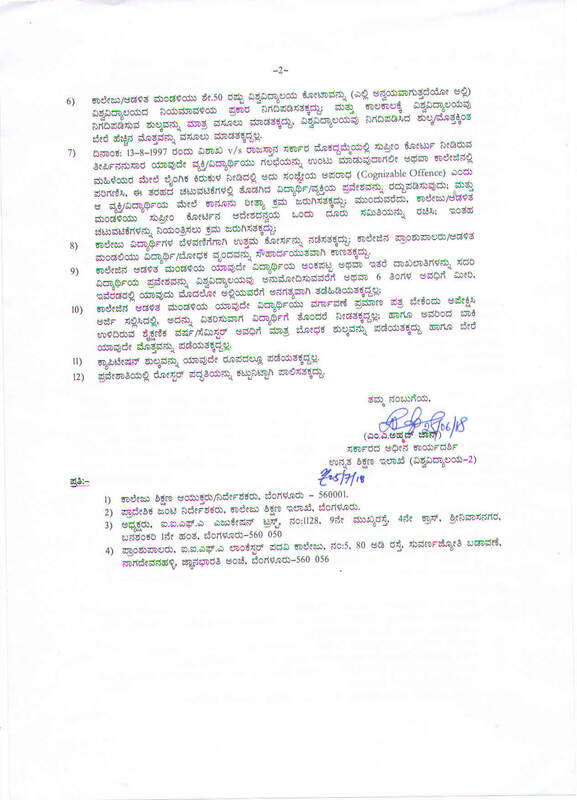 Campus Security: The BBMP has recently completed the University Road project. The Campus has now very good roads. We have taken steps to improve the Campus security. We are installing C.C. cameras at key points with adequate lighting. We are also planning to put 5 to 6 ft. height barbed wire fencing on either side of the public roads passing through the campus restricting the entry of public. The College Development Council has effectively coordinated with the colleges to submit proposals for various Schemes of UGC during the XII Plan. During the year 2009-12, Colleges were sanctioned grants to conduct UGC sponsored Add-on Courses. Eight new Colleges have been enlisted by UGC under Section 2(f) of the UGC Act entitling them for UGC grants. Bangalore University has Health Centrefacilities both at Jnana Bharathi and Central College Campuses to meet the immediate health care needs of students, faculty and staff. The University is planning to upgrade the health care facilities with necessary equipment and other infrastructure It is gratifying to note that Bangalore University is ranked No. 15 among the top 50 Universities in India as per Hansa Research Survey 2014 (published in The Week June 2014). The same survey ranks the University at 5 of the Top 10 Government Universities in South Zone. India Today (June 30, 2014) Ranked Bangalore University at No. 11 among the top 45 Universities in India. Certification for a course from a college or any university plays an important role in the career of a student. and its certificate is accepted globally.